There are no fairy godmothers in Naples. Prince Charming is the “King” of the underworld—and he’s no prince. Fortunately, Mia is a resourceful young girl, but not for long. She is about to come of age and inherit her murdered father’s fortune in Ivan Cappiello, Marino Guarnieri, Alessandro Rak & Dario Sansone’s mature animated fable, Cinderella the Cat, which screens during Fantasia 2018 in Montreal. Vittorio Basile’s plan to revitalize the Naples seaport district is so visionary, only he understands it. His grand QE2-like cruise ship headquarters and its pseudo-artificial intelligence only hints at the potential grandeur of the project. Unfortunately, Basile falls for the wrong woman, torch-singer Angelica Carannante, who is conspiring with her lover, gangster Salvatore Lo Giusto to kill Basile as soon as the rings are exchanged. They will have to keep his young daughter Mia around until she is old enough to sign over her inheritance, but that does not mean her wicked step-sisters (and drag queen step-brother) have to be nice to her. Young Mia had a rather touching relationship with her bodyguard Primo Gemito (sort of like the Man on Fire movies), but alas, he is the first person Carannante fires. However, he will make a dramatic return to the now shabby-looking ship as an undercover cop. Frankly, the rusty vessel is a good place to nose around, because it often records significant moments and projects the holographic playback at times that are either extremely opportune or inopportune, depending on one’s perspective. This is not a Cinderella for kids, but it is wonderfully stylish and rather inventive. With its retro-futuristic fairy tale setting and holographic imagery, it feels something like a cross between the under-appreciated Italian science fiction classic, Morel’s Invention and maybe Streets of Fire, or who knows what. Plus, as an added bonus, there are several contemporary pop-big band musical numbers that are quite jaunty. Yes, there are four, count them four, credited directors on Cenerentola, but the look and tone are always consistent. Along with three additional co-screenwriters, they create some unusually sharply drawn characters. Their villains are particularly strong, especially the glamorous femme fatale Carannante. Arguably, the traumatized Mia is the least developed, but everyone around her more than compensates. There is a cat who occasionally slinks in and out, but the title is figurative. However, there is a talking crow, who has a significant role to play. 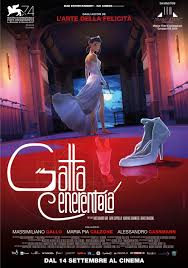 Frankly, this Cinderella is probably too adult for GKIDS to handle (more so even than Chico & Rita or Mind Game), which is a shame, because they might be the only distributor who can handle animation this sophisticated. Regardless, animation fans will be impressed by the originality and ambition of this noir fairy tale. Again, it should be fully understood this is not a kid’s cartoon. It is meant for grown-ups with discerning taste, who still enjoy a little mayhem. Very highly recommended. Cinderella the Cat screens today, as part of this year’s Fantasia.